An introduction to the fundamental concepts of motion and force. Teachers will explore and discuss teaching ideas and resources which will deepen students’ understanding of these concepts. The course is designed to strengthen teachers’ understanding of the content required in the linear AS and A level mathematics specification. This course is designed for teachers who have not previously taught mechanics. It may also be suitable for teachers of the higher GCSE who wish to broaden their knowledge. To book on this course please go to https://goo.gl/forms/RBABz5wH8j805P2W2. In this workshop, Alison will share strategies to help overcome students’ reluctance to engage with unfamiliar contexts, and suggest ideas to develop resilience in the maths classroom. Teachers will have the chance to work on a variety of problems on the NRICH site and explore ways to embed these tasks into their schemes of work. To book, please go to https://goo.gl/forms/c1s2ktqC1BarzYzj1. 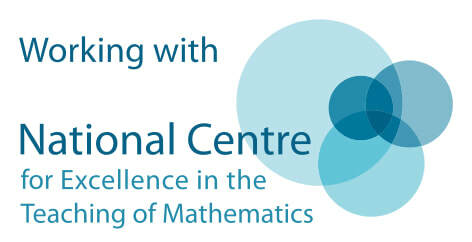 This conference is suitable for any teacher planning to introduce Core Maths to their school or college, or any teacher who is currently teaching Core Maths. The content included on the day will be relevant to all of the Core Maths specifications. Please click here to see the flyer. In this workshop, Alison will share lots of practical ideas for developing students’ reasoning skills at A Level. Teachers will have plenty of opportunities to try out tasks for teaching proof and logical thinking, and explore ways of encouraging students to reason critically. 6th July 2018 Walsall Campus, University of Wolverhampton, 9.30am-3.45pm. Both days will include three hands-on sessions and a closing lecture. The workshop sessions include Seigengineering where students will get to build and deploy a trebuchet, Eric the Sheep who does not like to wait in queues and the Dragon Quiz. Students will get to experience all three workshops and join in with the interactive closing lecture by Avril Steele. To view the flyer and book please go to http://furthermaths.org.uk/WM_enrichment. West Midlands Teacher Network Meeting, 4th July 2018, Walsall Campus, University of Wolverhampton, 4.00-6.00pm. The workshop explores the functions of the CASIO ClassWiz calculator and how to best use the new functionality at GCSE and A Level Mathematics. NRICH Problem Solving at KS3 and KS4, 11th July 2018, Chancellor’s Hall, City Campus, University of Wolverhampton. NRICH Proof, Logic and Reasoning – bridging the gap between KS4 and KS5, 11th July 2018, Chancellor’s Hall, City Campus, University of Wolverhampton. These CPD sessions are now fully booked but if you would like to be added to a reserve list please contact Liz Price liz.price@wlv.ac.uk. Introduction to Mechanics for Beginners, 12th July 2018, Aspen Room, Telford Conference Centre, University of Wolverhampton. This CPD course is for teachers who have not previously taught mechanics or for GCSE teachers who wish to broaden their knowledge. There are only a limited number of spaces left on this course so booking as soon as possible is essential. To view flyers for these events and book go to http://furthermaths.org.uk/WM_CPD. Do you want to improve your subject knowledge and develop your classroom practice in specific aspects of post 16 mathematics? If so, then one of the FMSP funded sustained professional development courses may be just what you are looking for! NEW FOR 2018: All teachers applying for FMSP sustained courses and who are working in state-funded schools and colleges will be eligible for an FMSP bursary covering their course fees on completion of the course. These courses aim to enable participants to gain a deep understanding of the subject content, to develop confidence and skills to teach and to introduce a range of resources to engage students. The courses run from early 2018 till summer 2018 and consist of two face to face study days, a series of live, online sessions, dedicated web-based teaching and learning resources and support from expert tutors. Teaching Further Mathematics 1 (TFM1), is designed for A level Mathematics teachers who are currently teaching Further Mathematics or who wish to teach it at some point in the near future. Teaching Mechanics 1 & 2 (TM1) is designed for A level Mathematics teachers who are already teaching some mechanics or who wish to teach it at some point in the near future. (TM2) is designed for teachers who have taught M1 and possibly M2 but wish to develop their understanding of further maths topics. (TS2) is designed for teachers who are teaching the statistics content of the linear Further Mathematics A level. Teaching Discrete Maths (TD) a brand new course designed for anyone teaching the discrete or decision maths units as part of Further Mathematics A level. The deadline for applications for some of these courses is approaching so don’t miss out on this opportunity for free PD! Thank you for taking the time to read this email and I hope you find this useful. Please contact your local area coordinator if you would like any further information related to the above. Ø Click here to renew your registration with the FMSP. o Did you know that registration needs to be renewed annually to be able to access our excellent resources? o Free teaching resources covering Further Mathematics and the applied content of Mathematics A Level. Resources include: notes, exercises, classroom activities and on-screen interactive resources! o Free FM Videos covering all aspects of the new Further Mathematics A level curriculum. o A new student login so your students can access these videos for themselves. o These videos cover how overarching themes and technology can be incorporated into AS and A level lessons for mathematics and further mathematics. Free support from the FMSP and University of Wolverhampton through CPD events to support the planning of the new A level and Further Mathematics courses. These will be in the form of Teacher Network Meetings and one day events. Click here to read more about the independent research which was conducted by the Oxford University Department of Education. Secondary school subject teaching. EEF receive relatively few applications about improving subject-specific teaching and attainment in secondary schools up to GCSE so if you are/are planning to develop a subject area as many people in schools may be if carrying out action research, this may be of interest. Interventions that aim to improve how teachers mark pupils’ work. Following the publication of the EEF review of the evidence about marking, A Marked Improvement proposals are invited that focus on improving the quality and impact of written marking. We want to hear from schools who are looking to try out innovations of teaching and learning practices. Sometimes these are approaches that teachers have developed themselves, sometimes these may be adaptations of approaches that have been proven to work elsewhere, which teachers have altered to suit the needs of their students. The amount of funding per project will vary depending on length, the cost and intensity of the intervention, the number of schools and groups involved (you might want to work within your MAT for example). The maximum amount that can be requested is £5,000 per school participating (with a maximum of £20,000 per project). More information will be coming out in the next newsletter, but do get thinking in the meanwhile!